One of the many fabulous reasons to EPP is it's portability - you really can take it anywhere and it is so relaxing to be able to sit outside and sew on those rare sunny days in England! I think I look like a dork. Lovely Liberty and Architextures crosshatch. It's going to be a cushion and I'm planning on hand quilting it. after all EPP isn't a race. Paperpieces.com is offering our readers 20% off their entire shopping cart, no minimum purchase, with the code UNDER20 throughout the entire book tour. Or you could head to your local bookshop. Of course you should leave a comment on this post because one lucky person will be winning a copy! Please only leave ONE comment and PLEASE leave your email in the comment - no reply bloggers will just not win. The giveaway will be open until 21st June and the winner will be chosen by random.org here on 22nd June. Oh, you are pretty! And all your EPP projects are lovely! Liberty is perfect for these little projects, isn't it! Thanks for the chance to own a copy of this book! I have only done one EPP project and it was quite satisfying but I will need to embrace the 'it's not a race' attitude for my next one :) And you look beautiful - not a dork!!!! Love all your projects - but especially the Rose Star quilt - I must get started on one of these! Thanks for sharing. Hubby is correct....dont argue with a man paying compliments! Liberty epp is beautiful too!! Hello Dork! Its nice putting a face to a name! In love with your latest project! That sounds like a must have book!! I love your Rosé star blocks, and that liberty is a starburst of yumminess! I think the dork photo is beautiful!! Your projects are beautiful! I'm just learning about epp, and it looks like fun. I would love to win this book! I just started EPP hexagons and would love to learn about the other shapes I could EPP. Thanks for the giveaway!! Love the car seat quilt and your latest project! Can't wait to see it quilted! Just beautiful...I have only done hexagon shapes...but it looks like I need to branch out! The Rose Star is lovely! Love the Liberty Star. As I'm always on the go, then it sounds like a book I need to take a look at. Listen to your husband, you do look beautiful. Lucy, your EPP is beautiful and so are you! I've always wanted to give EPP a try, though my hands already cramp up when I hand-stitch the binding on a quilt so I've worried about doing more damage with lots of hand stitching. Does that happen to you or do you just do it such small amounts that it's not an issue? I love EPP! I've only one project so far (The Pelt, http://www.flickr.com/photos/24334738@N07/9054405564/), and it's hexies and largely "unplanned", but I want to try other EPP quilts, too! All your projects are great. I would love a chance to win the book and be able to make such cute things. I love epp. I recently finished a 126" x 102" gfg quilt made with 1" hexies and would love this book for some inspiration for my next project. It really does go everywhere. Tae Kwon Do, swimming lessons, long drives, doctors appointments, even Jamaica although the locals didn't understand what a quilt was when I was asked what I was doing! Parts of mine went everywhere for two years. LOL, no one should definitely not EPP and drive. EPP looks like a lot of fun and car time would be a great time for me to do some. Alas, I have to do most of the driving as my husband either falls asleep or succumbs to his ADD and starts looking at everything but the road. Arg. Thanks for sharing and your EPP looks fabulous and very precise. Your rose star quilt is beautiful. Thanks for the chance to win the book. Your EPP projects are beautiful! Thank you for a chance to win this book. I love your latest EPP project. If you are a beginner it doesn't show. Thanks for the chance to win the book. love your epp project.. can;t wait to see when it is completed. It is gorgeous! Your star rose quilt is looking fabulous! And you look beautiful EPP. I'll try not to EPP and drive lol. Super cute picture. Thanks for the giveaway! Liberty and EPP are the perfect match, aren't they? Thanks so much for the chance to win this wonderful book!! I loved this post - so fun. Hey your husband is right and you are wrong. (Don't you just hate when that happens! LOL) I've been wanting to do EPP for years and I just keep putting it off. I such get the book and that would get my motor started. I love your work - so beautiful. Hello! I hopped on over from Jessica's blog to visit your blog for the first time and I'm so thrilled with your fabulous creations! Your EPP patchwork projects are lovely - the Liberty 60 degree diamonds almost made me faint! And your hubby is right, you look beautiful! You do look nice in the photo. I would love to try EPP, but have not tried it yet. I like that you include photos of yourself, even the ones that you think you look dorky (though I agree with husband, you look lovely!). Thanks for the chance to win. Ha! You're hilarious:) Love the liberty star you're working on. That's just amazing. I can't wait to see it hand quilted too. Yum! I agree we shouldn't quilt and drive though, hehe. Thanks for the awesome post. It amazes me how you get so much stitching done with the littles around.. you're an inspiration. Hei!Nydelig,tålmodighets-arbeid!Kan lite om papirsying,så det hadde vore kjekt å lært!Beste hilsen Quiltegleder Margrethe som er din følger. I love your comment about EPP not being a race. I NEED something in my life right this very second that will sloooooow me doowwwwwnnn. It must be an omen. I got hooked on hexies not too long ago. I love them. I'd love to have the book. 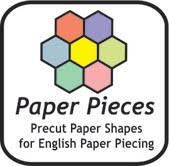 Paper piecing looks very interesting and fun. Thanks for a change to win. I am in the middle of a large hexagon project. It is so relaxing. I was just wondering what size 60 degree triangle pieces do you make? They sell various sizes. I was looking at triangles with 1inch sides. Would appreciate a response at qltr89 (at) gmail (dot) com. Thank you for a chance to win. At the moment I am working on my third hexie project. I would love to try a few other designs and this book sounds marvellous! Love the photos, not at all dork lile! The liberty quilt looks fab too, I brought home some liberty print fabric this w/e when we cleared hub's gran's house, might have to add a liberty epp project to the to-do list. I'M IN THE MIDDLE OF MAKING A THROW OF BROWNS/CREAMS. Seeing your Rose Stars quilt reminds me that I should pack my Grandmother's Flower Garden pieces for an upcoming trip. Thanks for the inspiration. I use a cobbled method of EPP for making hexies. It would be wonderful to learn the proper method of EPP, shapes other than hexagons, and a real quilt pattern with finishing instructions. Thanks for that chance. These patterns are lovely. Now I need to start thinking about your Rose quilt too. i have yet to jump on any quilting bandwagons, but i am in on this one! portability is the key attraction. that and your liberty star. i'm swooning! on the personal side, you, lady, are quite lovely yourself. i've been picturing you as a blonde, though? i thought that's how you looked in the profile pic. either way, you're a pretty picture. especially with needle in hand. =) my husband thinks i'm pretty and knows i'm a dork, so they are not necessarily mutually exclusive. ha! I love the look of your liberty diamond cushion. I just got a charm pack despite my self imposed fabric ban (whoops) and now know what to make for my mum for her birthday! Thank you! Also thanks for the chance to win this book. It looks like something I need in my life. I was sewing hexies on the train this morning and the commute flew by. I love Epp! I do it in the car when we go on road trips. I've only done hexies but I'd love to try other shapes! yes please, I'd love a copy, I have heard so many positive comments about the book. I do EPP in the car but I usually don't drive. Oh and I do it on the train too! Thanks for the chance to win. I agree with your husband--you look beautiful! I'm currently working on my first EPP project (I AM IN LOVE), but I'm having thread issues. What do you use/recommend for piecing? You do sewing, 'dork' comes with the territory pretty lady! Don't EPP and drive? Hilarious!! I have to say you look totally different in those pictures. I imagined you with dark blonde hair in your profile pic. But holy numb nuts. Those projects are absolutely precious! Precious! This is a nice giveaway as I am currently dabbling in my first EPPs. EPP is so relaxing! I've got all my tumbling blocks sewn together - now to get started on joining them all. A multi-year project to be sure! Your cushion will be beautiful! I am very uncool because I can't make a hexie cushion and everyone else can. Please help me be cool. I love your Rose Star quilt and your pillow. I'm going to have to try making hexies one day too, I havn't felt brave enough so far but maybe if I start with something small... Thank you for the inspiration. I am definitely going to give it a try, and am going to start a grandmother's flower garden quilt over the summer for my niece, though she may have to wait a (long) while for it to be finished! I'm newish to EPP, but loving my first project. I would love to win this book. Thanks for the chance. Gorgeous projects! My problem is I'm too impatient to wait that long to finish something! I definitely need some short project ideas. You do not look like a dork! I always am critical of pictures of myself. And your EPP is so perfect. I'm working on a hexagon project. Don't know what it will end up as. At the rate I'm going, it will be done in 2020... maybe. This is a fascinating books, I would love to read through it!!! I think your husband is right. You don't look like a dork. I really like the star block you are making. I have made a lot of hexagons, but I haven't tried to make these. I would really love to have this book. Thank you for a chance to win it. I love this book and need to get one! I love EPP! I love your hexie projects. I have a bunch of hexies and the fabric to get started but I'm a little intimidated with the whole EPP thing. I'm sure the lovely book would help. Thanks for the give away. Love your Hexie 's Thanks for the giveaway! Hexie's are so pretty! I haven't tried making them yet. This book would help! Thanks. The Liberty diamonds are stunning but the Rose Star is looking pretty awesome. Great choice of fabrics there. I'd love to have a chance at winning the book. I'm well into a Grandmothers Flower Garden quilt that I really need to finish. I love all your beautiful project! Maybe if I won I could learn! Comlisajohnson(at)gmail(dot)com fingers and toes crossed! This book is on my wish list. I always carry an EPP kit with me, I do it in the car, in the garden, at work in my break times and when we watch TV. I like to keep my hands busy. My current project is a 72" x 94" Hexie quilt. I would love to win this book! I so want to learn this method! Thanks for the chance. I like your comment "EPP is not a race". It is slow going, but after 9 months, I have a pile of completed hexagons, and a few flowers I have put together. It is very relaxing to do while watching TV with the family, or while waiting for the kids at activities, or that long wait at the doctor's. I do believe it helps to keep my blood pressure down at the doctor's office. Love your Liberty pillow cover-to-be. The book looks great too. I love your star cushion. with 2 little ones sometimes it is impossible to get time at the machine. Love your EPP. I have a little pouch that I carry my hexies all over with me in just so I have something to sew if I get bored where ever I am. Projects are so beautiful. Thanks for sharing. Your EPP is awesome! I love Liberty prints! Thanks for the chance tow win. I love doing Epp on the go and would love to win this book. Luv your epp projects! Thanks for the giveaway ... would love to win a copy of the book. EPP is on my list of things to try this year, and now that the year is half way through i ought to make a start. I'll order some papers today! The book looks really awesome! I have just started EPP, I am working on hexies and keeps seeing more and more that I want to try! I love the different shapes and I am always looking at portable projects for me to take on the go! I love the picture of the light shining through the Liberty and Architextures project - it reminds me of a stained glass window. My husband and his mother first introduced me to EPP around five, maybe six, years ago. I didn't have a sewing machine and really wanted to make my sister a quilt for her birthday that year. Needless to say, I was over ambitious and it was a few years before she got the quilt! Oh wonderful! Must start another EPP project. This book seems to be full of inspiration and I would just love winning it. Thank you. I would love to win this book and try out some of the projects. I 'll buy a copy if I don't win. Thanks! Aww you are the cutest mobile epp'er! Beautiful work. I'm giving the diamonds a try on my vacation next week. Your projects are beautiful-thanks for sharing and for the chance to win this book! I have only recently started EPP, but I'm hooked. I love the portability. Im making EPP hexis at the moment.......(well its going to take some time this project) but having avoided EPP for years............now I am totally hooked! Gosh this book sounds perfect........ many thanks for the chance to take part. I adore your diamonds.......utterly beautiful! Great work!. I love EPP, it is so relaxing and makes me smile to see my husband cutting diamonds for me!. Thanks for the chance to win Jesica's book, one way or another it will be in my hands soon!!! !, ha,ha. I'm so looking forward to learning EPP - this book would be a great help! Love your EPP! Thanks for the chance to win! So many beautiful projects. I love EPP for something to do when watching tv in the evenings. Funny! As per your pic. The is UFO flying by but you don't give a shhh because you doing some EPP! Enjoy it and thx for the giveaway. I love the diamond cushion - so pretty. I love EPP - I'm about 70% of the way through sewing together hexagons for a single bed quilt. Would quite like to have finished by now! Thanks for the giveaway. EPP is awesome :) I've been working on some stars with Christmas fabric for two Christmases... it'll get done one of these years! I even took it on vacation with me a few weeks ago - Christmas fabric and the beach are a weird combination! Love EEP, have project going of stars and loving how it's turning out. You should listen to your husband ~ you do look beautiful! I love your WIP with the Liberty scraps! I like EPP and definitely want to get this book. I've only done hexagons so far and would really like to try some other shapes. I have plans to EPP this summer, this book would be very nice to have. I love your projects. Please count me in for this lovely giveaway. Thanks. I'm interested in learning more about EPP. Thanks for the giveaway. My take-along project this summer is hand-quilting quilt blocks--I'll sew them together later. I got 20 min in while watching my daughters swim class today. I've never done EPP, being fairly new to the quilting scene. Plus, I'm not a very patient quilter. But the idea of portability is very appealing to me! Also, the idea of fussy cutting tiny scraps sounds like fun! Looks like a great book. I'd love to give EPP a try! I love Epp ing and books, and the photo of you. You do NOT look a dork - you look kind of wistful! This looks like an awesome book, and I love your liberty & architextures pillow coming along! Can't wait together my hands on this book. I have 2 EPP projects on the go at the moment and they take turns living in a little suede clutch in my purse. I keep my threads on floss cards so they are flatter and my thread and needles are in a little metal card box. It works so well for me. I checked and could not see if I had left a comment before.... But I love the whole project on the go!!! I would love to win this book! I have over 1200 hexies made just waiting for the right project! Thank you for the chance. I love to make hexies, and this book has some wonderful projects with other shapes. Love your diamond cushion above, that's the shape I'm interested in trying next. Thanks for the give away! I would love to win this book and maybe it would spur me to jump back into EPP! I love what you are working on now, the Liberty fabrics are so gorgeous in your EPP block, it will be a beautiful cushion. My husband started chemo a couple weeks ago, and EPP is a fabulous project for me to take along for me not to get bored while I keep him company for the 5 1/2 hours it takes. I'm working on 3/4" hexies today. I love your rose stars and the diamond start cushion cover - so many beautiful ideas in this book! Thank you for the giveaway! Love the projects...sew much fun! I love your rose star quilt. 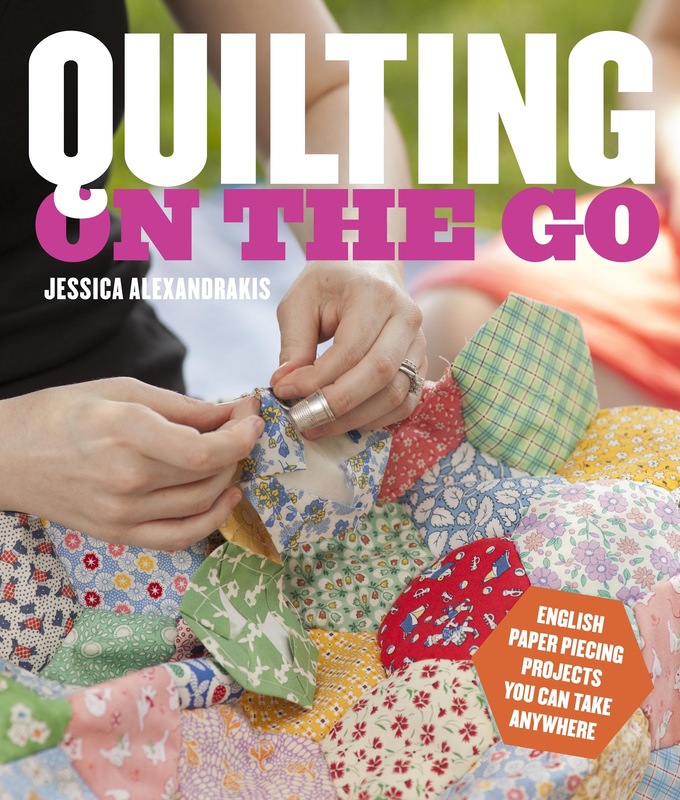 I would love to win Jessica's book; thanks for the chance to win! Thank you for putting my name in the hat for the drawing! I think that your husband sees and loves the wonderful look of serenity on your face in that lovely picture. That is what quilting should bring to our lives. your pieces are beautiful! i don't really understand what EPP is.. but I suppose if I win, then I can learn, right? What a great looking book. I really hope I win, but if I don't I'll just have to buy it! I love the Zen of EPP. The book looks great, and new ideas always help get the creative juices churning. I would love to learn EPP. This book looks like the perfect one for that. Thanks for sharing. EPP looks so hard. I've never tried. Are you in the Simply Solids bee? I'm in Gamboge group. Thanks for sharing! These are such great projects! I've done one block of epp in a sampler and loved it! I have all the supplies to make a hexie quilt but I need to get a few other things done first. Thanks for the giveaway! Love your Liberty and Architectures combo! I love EPP and I'm ready to move beyond hexagons. This book sounds like a wonderful guide for more exploration. Thanks for the chance to win a copy. Your picture is cute as a botton - And I love all of the EPP projetcs - those stars are fabulous!! I love the crisp lines and points from paper piecing but can't seem to get the hang of it. I love your piece. I would love to win this book! This would be great for me to do on my lunch break at work! What a delightful book! Thanks for the give-away. Love the advice about driving and EPPing. I'll remember that sage advice! Thanks for the inspiration - I've had my second go at EPP and loving it. I envy you your skill though. More practise needed here!